Chapters From My Life: Can someone really make me angry? Sadly Yes..
"He makes me feel so angry". Everyone has heard this, and everyone has said this one time or other. OK, maybe you have said ‘she’ instead of ‘he’. Do people actually have the power to make us angry? Aren’t we in charge of our emotions? Often, our dark emotions jump out without much provocation from an outside source. I know. I myself overreact to situations and also to abusive language. Even when I cool down I never feel bad about what I have done. Once in a while I sit down to evaluate my behaviour, and it is then that I realize that I gave the control of my emotional reins to other person who made me angry, sad, happy etc. I am better at holding the reins of my emotions now then I was earlier, but even to this day; I know I am not good enough. You are welcome to share your views on this topic. I would also like to share with you here a story I had read, as it has been very inspirational in making me think twice about what others say. face. Ultimately the man was tired of abusing him. He asked, "Don’t you have any shame? I have been abusing you and you have taken it all like a coward. Don’t you have enough guts even to be angry with me?" Lord Buddha calmly replied, "My dear brother why should I be angry with you? You have not done me any harm. You just offered me some abuses which I do not need so I have not accepted a single abuse from you." "But you heard all of them, didn't you?" The man argued half-half-heartedly. Buddha said, "I do not need the abuses, so even if I hear them they do not affect me. They are nothing more than mere sounds that we hear all the while but never give attention to it"
Now the man was even more puzzled. He could not understand the calm reply from Buddha. Looking at his disturbed face, Buddha further explained, "All those abuses remain with you." "It cannot be possible. I have hurled all of them at you," the man persisted. Buddha calmly repeated his reply, "But I have not accepted even a single abuse from you ! Dear brother, suppose you give some coins to somebody, and if he does not accept them, with whom will those coins remain?" The man replied, "If I have given the coins and the person does not accept it, then naturally they would remain with me." 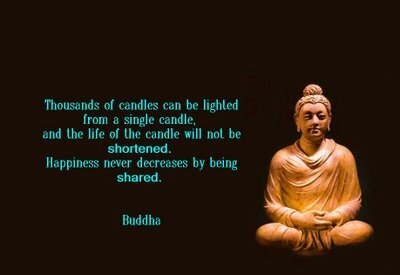 With a meaningful smile on his face, Buddha said, "Now you are right. The same has happened with your abuses. You came here and hurled abuses at me, but I have not accepted a single abuse from you. Hence, all those abuses remain with you. So there is no reason to be angry with you." The man became speechless. He was ashamed of his behaviour and begged for Buddha's forgiveness. So true. No one can make us miserable like we can! I liked the story as well. Now that is a story I would like to share with my boys. Simple and full of wisdom. The sad fact is that we tend to let things and people get under our skins, which makes us weak and them strong. It takes a lot of self control though, to be in charge of one's emotions and consequently, life. so true.... beautiful tale indeed! Loved it!...Anger is our worst enemy however anger directed against the ills of society is essential. Unfortunately, we don't show enough constructive anger for issues that matter! And congrats for the trophy and the prize money! WAY TO GO! Very good Farida! Why do we get so upset when we don't have "control" over what is said or done to us? Every body gets angry at some point of time but let that not be carried in our mind for ever. Recollection of those angry moments and analyzing our folly is the best way to correct ourselves.